Hey there! It's me, Twinkle Cottontail, Toontown's one and only Easter Bunny! I've come from the depths of the Tooniverse with many eggs to share with you Toons. It looks like they didn't get far, though! I've seen some of these two-legged beasts in Goofy's Speedway and Donald's Dreamland. I hear one of my unsuspecting eggs was accidentally pied in Toontown Central, and now he hasn't the slightest clue where to go! Rumor is that some of my eggs have turned rotten, haunting each of the Cog HQs! Be careful around them - who knows what hex they'll cast on you! Sticky Lou tried to catch some of these pesky eggs, but they were just too fast for him. I have a really important request... Please bring my eggs back to me! If you bring me enough eggs, I will give you some truly exotic Easter clothing, straight from Ostown! I've also got a paint bucket or two - I'd be glad to turn you into a pink or white Easter Bunny! Sharing is caring, after all! Happy Easter, Toons! And remember - I'm leaving on the 7th, so let's get scavenging! 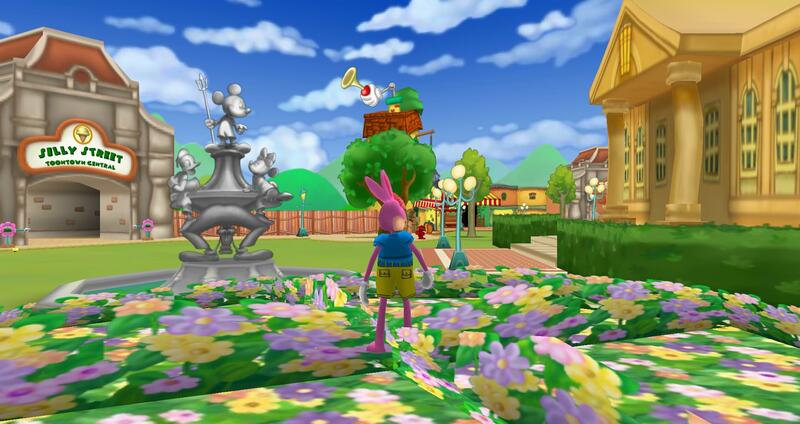 - All buildings can now be invaded in Toontown!